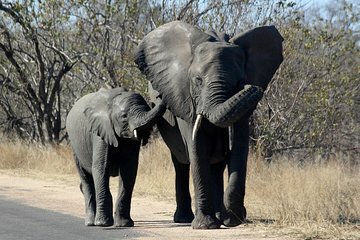 Spend a full day in Kruger National Park without the hassle of renting a car on this tour from Maputo. Ride in an open vehicle through the park to spot Africa's Big 5 with the help of a guide/tracker. You'll be provided with breakfast en route after your early morning pickup, lunch in the park, and logistical help crossing the border into South Africa, which helps make the tour seamless and stress-free. Any activities, meals or accommodation not specified in this program. Bank Transfer/Credit Card Fees and exchange rate Fluctuations. A current valid passport with 6 months validity is required on the day of travel. Visas are our Guests responsibility. Our guides are Multi - lingual in English, Portuguese and Spanish.